All in one chewable tablet. With Trifexis, you can play with your dog immediately after treatment. There is no need to isolate your pet. Just treat and play! 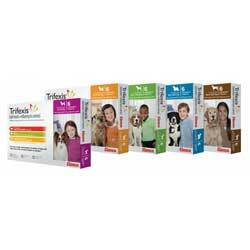 TRIFEXIS (spinosad and milbemycin oxime) is available in five sizes for oral administration to dogs and puppies according to their weight. Each chewable flavored tablet is formulated to provide a minimum spinosad dose of 13.5 mg/lb (30 mg/kg) and a minimum milbemycin oxime dose of 0.2 mg/lb (0.5 mg/kg). Spinosad is a member of the spinosyns class of insecticides, which are non-antibacterial tetracyclic macrolides. Spinosad contains two major factors, spinosyn A and spinosyn D, derived from the naturally occurring bacterium, Saccharopolyspora spinosa. Spinosyn A and spinosyn D have the chemical compositions C41H65NO10 and C42H67NO10, respectively. Milbemycin oxime is a macrocyclic lactone anthelmintic, containing two major factors, A3 and A4 of milbemycin oxime. The approximate ratio of A3:A4 is 20:80. Milbemycin A4 5-oxime has the chemical composition of C32H45NO7 and milbemycin A3 5-oxime has the chemical composition of C31H43NO7. TRIFEXIS is indicated for the prevention of heartworm disease (Dirofilaria immitis). TRIFEXIS kills fleas and is indicated for the prevention and treatment of flea infestations (Ctenocephalides felis), and the treatment and control of adult hookworm (Ancylostoma caninum), adult roundworm (Toxocara canis and Toxascaris leonina) and adult whipworm (Trichuris vulpis) infections in dogs and puppies 8 weeks of age or older and 5 pounds of body weight or greater. Administer TRIFEXIS with food for maximum effectiveness. If a dose is missed and a monthly interval between doses is exceeded, then immediate administration of TRIFEXIS with food and resumption of monthly dosing will minimize the opportunity for the development of adult heartworm infections and flea reinfestations. If vomiting occurs within an hour of administration, redose with another full dose. TRIFEXIS should be administered at monthly intervals beginning within 1 month of the dog’s first seasonal exposure and continuing until at least 3 months after the dog’s last seasonal exposure to mosquitoes (see EFFECTIVENESS). TRIFEXIS may be administered year round without interruption. When replacing another heartworm preventative product, the first dose of TRIFEXIS should be given within a month of the last dose of the former medication. Treatment with TRIFEXIS may begin at any time of the year, preferably starting one month before fleas become active and continuing monthly through the end of flea season. In areas where fleas are common year-round, monthly treatment with TRIFEXIS should continue the entire year without interruption. In a well-controlled laboratory study, TRIFEXIS was 100% effective against induced heartworm infections when administered for 3 consecutive monthly doses. Two consecutive monthly doses did not provide 100% effectiveness against heartworm infection. In another well-controlled laboratory study, a single dose of TRIFEXIS was 100% effective against induced heartworm infections. In a well-controlled six-month US field study conducted with TRIFEXIS, no dogs were positive for heartworm infection as determined by heartworm antigen testing performed at the end of the study and again three months later. In a well-controlled laboratory study, TRIFEXIS demonstrated 100% effectiveness on the first day following treatment and 100% effectiveness on Day 30. In a well-controlled laboratory study, spinosad, a component of TRIFEXIS, began to kill fleas 30 minutes after administration and demonstrated 100% effectiveness within 4 hours. Spinosad, a component of TRIFEXIS, kills fleas before they can lay eggs. If a severe environmental infestation exists, fleas may persist for a period of time after dose administration due to the emergence of adult fleas from pupae already in the environment. In field studies conducted in households with existing flea infestations of varying severity, flea reductions of 98.0% to 99.8% were observed over the course of 3 monthly treatments with spinosad alone. Dogs with signs of flea allergy dermatitis showed improvement in erythema, papules, scaling, alopecia, dermatitis/pyodermatitis and pruritus as a direct result of eliminating the fleas. In well-controlled laboratory studies, TRIFEXIS was ≥ 90% effective in removing naturally and experimentally induced adult roundworm, whipworm and hookworm infections. TRIFEXIS is a flavored chewable tablet. In a field study of client-owned dogs where 175 dogs were each offered TRIFEXIS once a month for 6 months, dogs voluntarily consumed 54% of the doses when offered plain as if a treat, and 33% of the doses when offered in or on food. The remaining 13% of doses were administered like other tablet medications. I strongly advise against buying the medication. It has a terrible chemical odor that I don't know how can you make your dog take it. I've tried to mix the medication with my dog favorite food but even I can smell it through.